Today is Howard Coy’s birthday. He’s 90 years old. I could describe so many great qualities about this man, but I will just say a few. He has been faithful to His Lord, his wife, his church, and whatever job that has come his way. I had the privilege of meeting this man about six years ago. My wife Lauren, who was my girlfriend at the time, invited me to come to her church. That’s where I met Howard Coy. He and his wife were sitting in the front row, I introduced myself, and we have been friends ever since. 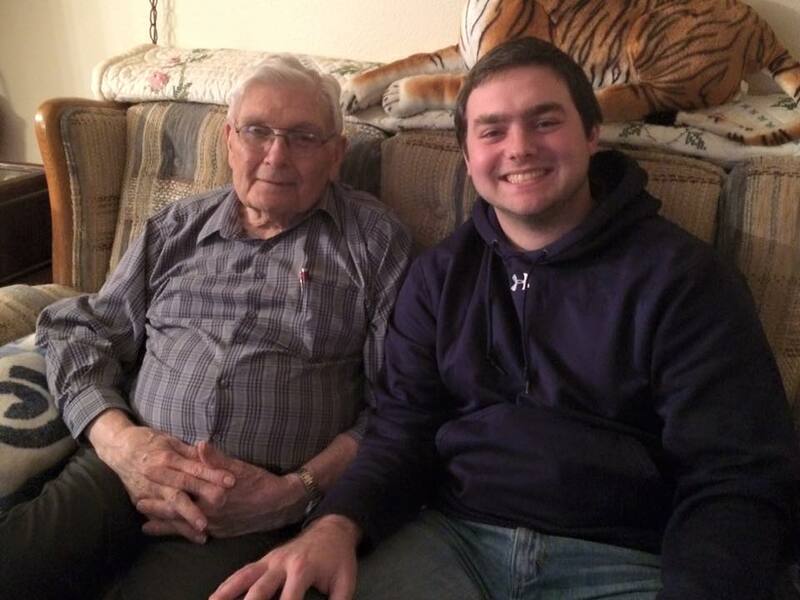 He is one of my mentors, my adopted grandfather, and he calls me his adopted grandson. Ever since I met him he has been a great encouragement to me. He and his wife have supported me and Lauren with love and care. He is also one of the funniest men that I know. If you’re around him for long enough, you will laugh. June 14th is Flag Day, but his joke is that people fly flags for his birthday. He loves his church. Mr. Coy has been faithful to the local church. He has cared for the people in the local church. He has served as a deacon for many years. He has trained deacons. He has supported his pastors and loved them. There have been a few occasions where Howard has had to stand up for the truth. He is a man that stands on the solid rock of truth and does not waver from it. He has not buckled under pressure. He has also been a man I am able to come pray with, laugh with, and cry with. It has been a joy to see this man as an example in this part of his life because I have seen many neglect this area of their own lives. He would say that his faithfulness to the church is because of Jesus and that Jesus has been faithful to him even though tough times have come Mr. Coy’s way. Jesus has been faithful. He loves his wife. Mrs. Marie is one of the sweetest people you will ever meet. Mr. Coy would definitely not be where he is if it wasn’t for his wife, but the same could be said for Mrs. Marie. They are like Sweet Tea and a Hot Summer day. You can’t separate the two. For Lauren and I, they have been a tremendous example that have given great godly wisdom and seasoned advice. You can even tell by the way they look at each other that there is just this love there. When I go home and see them, there is just something different about them. I pray that if the Lord allows Lauren and I to live to 90 that I am able to talk about my wife with the tenderness, love, and affection that Mr. Coy talks about his sweet wife Mrs. Marie. He loves the next generation of pastors and church members. Mr. Coy did not have to invest in me. He did not have to take his time and care for me and disciple me. But he chose to do it and he continues to invest, care and disciple me. I think it is very sad in the state of some of our churches that older men do not seek younger men to disciple/teach/lead. I also think it is a sad state when younger men think they know it all and do not need the men that have gone before them. I have heard countless stories from him and every story that he has told me has had a point that will impact my life and ministry whether it’s in the ministry of the church or with my wife. Every story that he has told me has impacted me in some form or fashion. It is hard to write about a man who has meant so much in your life and has always pointed you to Jesus. If you are a “young gun” and not being poured into by an older, wiser, seasoned follower of Christ, please seek that out. If you are a seasoned follower of Jesus and you are not pouring into a follower of the next generation, seek that out. Mr. Coy has been a godly example for me and will continue to be until I see Jesus face to face. Ten thousand years from now we will be rejoicing together with the King of Kings whom his life has pointed towards. We only get one life and it will soon pass. Only what is done for Christ will last! Happy Birthday Mr. Coy! I love you! Evan Knies, and his wife Lauren, are natives of Louisiana. He is an alumnus of Boyce College and is currently a graduate student at the Southern Baptist Theological Seminary in Louisville, Kentucky. He is Pastor to Students at Bullitt Lick Baptist Church. You can follow him on Twitter at @Evan_Knies.